DigitalBTC, an Australia-based Bitcoin company, debuted today on the Australian Securities Exchange (ASX) under the name of Digital CC Ltd.
DigitalBTC, an Australia-based Bitcoin company, debuted today on the Australian Securities Exchange (ASX) under the name of Digital CC Ltd. Its symbol is DCC. They become the first Bitcoin business to trade on a major securities exchange. The company earns revenue through Bitcoin mining operations and the trading of digital currencies. They are also working on a wallet, merchant services and API integration. However, their journey to becoming a regulated security was not conventional. They took the “backdoor approach”, first entering into a reverse takeover of Macro Energy Ltd, which was already listed on the exchange. This was the approach taken by Bitcoin Shop Inc, which trades on the OTC markets under BTCS. Its share price is $0.195 and market cap is $27.1 million. It is also reminiscent of the earlier partnership between Atlas ATS and the National Stock Exchange (NSE) to introduce regulated bitcoin trading. The NSE is recognized by the Securities and Exchange Commission (SEC) as a self-regulatory organization (SRO). 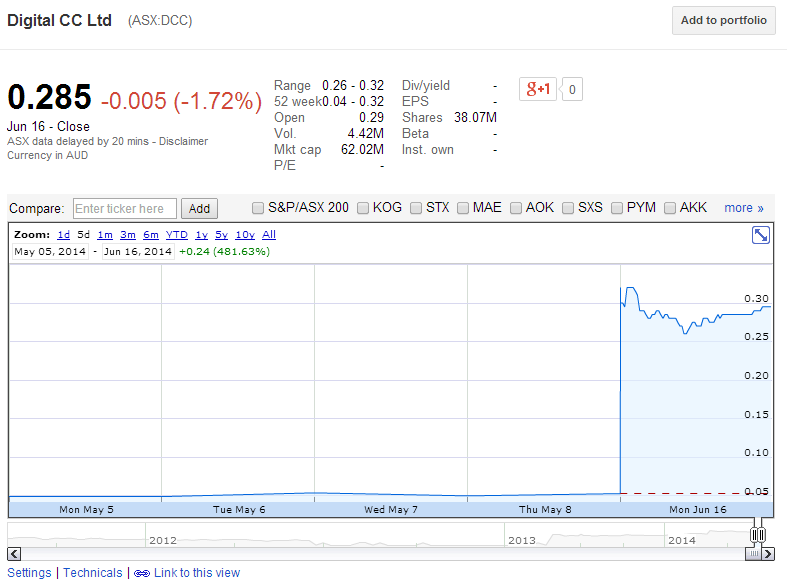 Shares of DCC ended the trading day down by 1.72% to $0.285. The company has a market cap of $62 million. Like Bitcoin Shop, the security behaves much like a penny stock. Around the time of the reverse takeover announcement in March, it skyrocketed by 200%, thus exhibiting a trading profile much like the digital currencies it trades. For much 2011-12, the shares were worth less than a penny. Shares had not traded since May 8 before relaunching today as the new entity. $9.1 million was raised in transforming the business and the March announcement said capital was oversubscribed. Shares were also consolidated (reverse split) by a ratio of 5.75:1.